Some designers get a lot of talk around the couch on knit night. For a somewhat random group of gals there seem to be a few that we all agree on, or at least appreciate. Two that definitely come to mind are Jared Flood (who wouldn’t love Jared’s designs with his stunning photography? He’s downright irresistible) and Ysolda Teague. Kynna is absolutely enamoured of Ysolda and has knit more than a few of her designs. When an unsuspecting knitter dared to ask ‘who is Ysolda Teague?’ the other night I thought Kynna might fall off the couch, the look on her face would make anyone laugh. 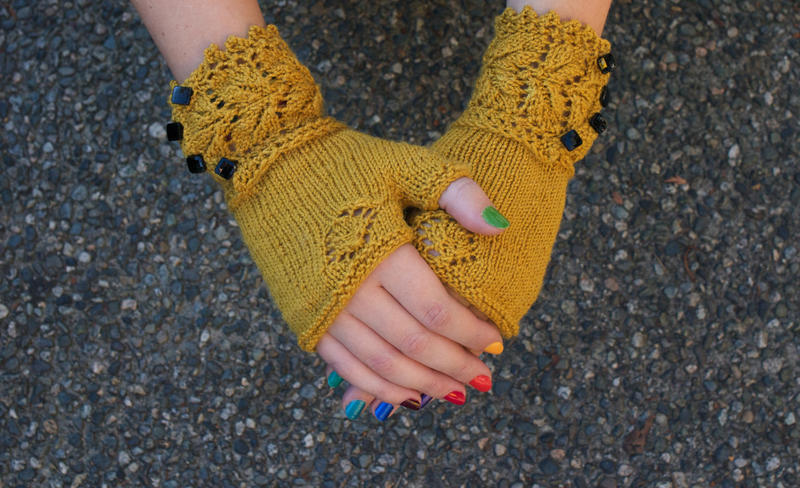 One of Kynna’s more recent Ysolda accomplishments is her Veyla mittens. 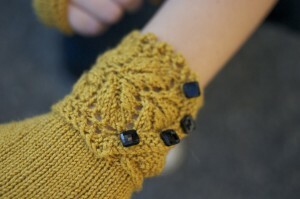 These are a lovely pair of fingerless gloves with lacy details and precious buttons. Just lovely. Not only is the pattern beautiful but Kynna has picked an awesome colour combination and some classy little black buttons from Button Button. The yarn is a soft sock yarn from Shibui called Staccato. As soon as we got Staccato in it was a hit. Amanda is knitting up some leg warmers and Kynna snapped up a skein for her Veyla’s. These would be a lovely quick knit for yourself to keep the chill off your hands this fall, or for a loved one this holiday season! 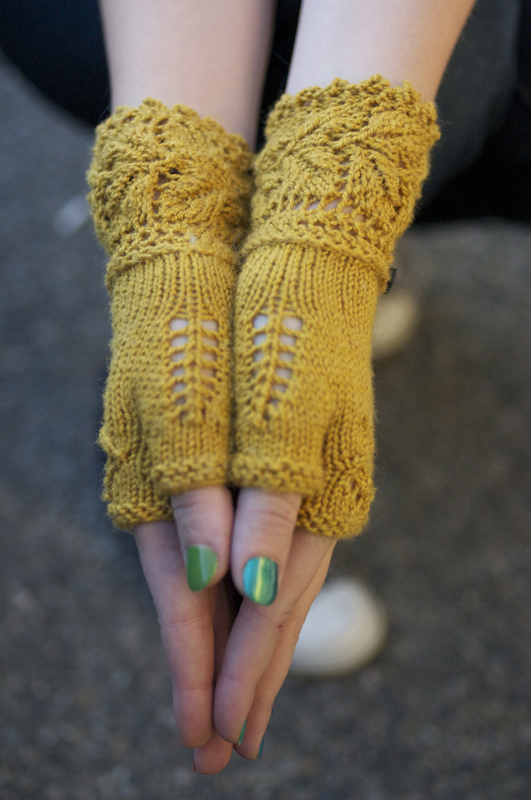 The pattern for Veyla can be found in Whimsicle Little Knits 2. We’ve got both of Ysolda’s books (WLK 1 and 2) and they are definitely worth a look so come on in and check them out! This entry was posted on Monday, November 8th, 2010 at 9:24 pm	and is filed under Uncategorized. You can follow any responses to this entry through the RSS 2.0 feed. Both comments and pings are currently closed.